Elmwood Park Zoo is lighting up the holiday season with a brand new, multi-day festival that is fun for all ages. 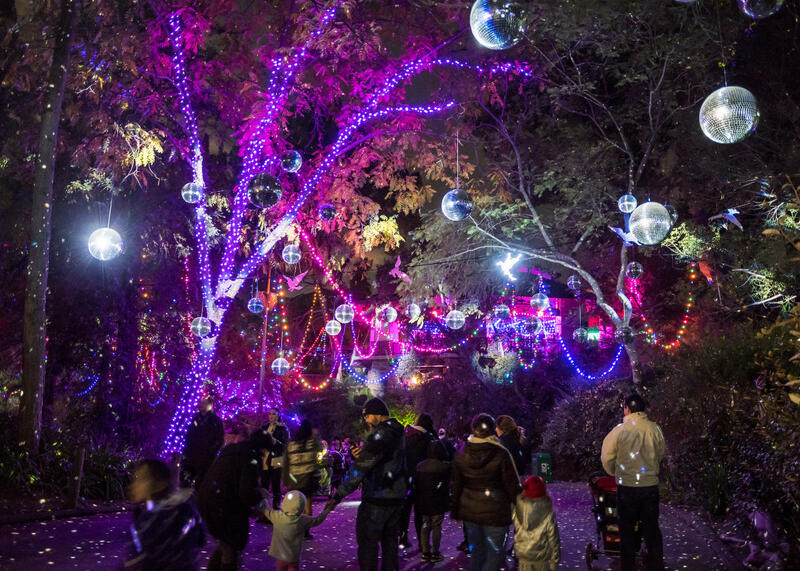 Wild Lights will feature millions of LED lights spanning the zoo’s entire 16 acres. Guests will be transported into a dazzling winter wonderland with the help of animated light installations, lit pathways, guided tours, music, and themed stops along the way. Wild Lights is generously sponsored by 1SEO, Philadelphia’s leading I.T. support and digital marketing firm. Additional support is provided by the Valley Forge Tourism and Convention Board. • Santa’s Workshop will be open to guests, where they can meet and take photos with the big man himself. • Santa’s live reindeer return to the zoo for guest greetings and photos. • The zoo’s vintage Carousel and Butterfly Train Ride will be open throughout each evening. • Treetop Adventures will offer rides on its “Quick Zip” course. Guests will wear lit harnesses that interact with select light installations. • Bubby’s Dessert Party features Elmwood Park Zoo’s bison mascot helping guests to an assortment of delicious holiday treats, a hot chocolate bar, and gingerbread men decorating stations. Wild Lights debuts to the public on Friday, November 16, from 6:00 pm to 10:00 pm. The festival continues Thursdays through Sundays until December 9, and then is open nightly, December 13 through December 31. It is closed Thanksgiving, Christmas Eve, and Christmas Day. Tickets and more information are available at epzwildlights.com. 1SEO I.T. Support & Digital Marketing is a Philadelphia-based digital marketing firm and managed I.T. service provider offering end-to-end solutions for their clientele. With a full range of services, including social media optimization, content marketing, search engine optimization (SEO), web development, pay per click (PPC), proactive I.T. support, and managed I.T. services, 1SEO I.T. Support & Digital Marketing helps their clients win online and maximizes the efficiency and security of their I.T. infrastructure. GES Events is part of GES, a Viad Corp (VVI) company and a global, full-service provider for live events, producing corporate events, exhibitions, conferences, congresses, exhibits and entertainment experiences. GES offers a wide range of services, including official show services, audio visual, cutting-edge creative and design, marketing and measurement services, and event registration services – all with an unrivaled global reach. For more information visit www.ges.com. Established in 1924, Elmwood Park Zoo in Norristown is home to dozens of wild and endangered species. As a nonprofit organization accredited by the Association of Zoos and Aquariums, its mission is to foster an appreciation for wildlife and the environment that will inspire active participation in conservation.